“What’s that?” said Ron, pointing at a large dish of some sort of shellfish stew that stood beside a large steak-and-kidney pudding. — J.K. Rowling, Harry Potter and the Goblet of Fire. Now that I’m nearing lady-of-leisuredom and have the luxury of going home at 5, I can do all kinds of things in the evenings. Namely, drinking, dancing while wearing a robot head, and cooking. This week, I recalled that it is October, though it’s hot as blazes (75 degrees, what up), and that I had a pound of fish in my freezer. Hence, bouillabaisse. I took a day to defrost the fish (leftover from the ceviche I made for E’s grumpy 17-day diet dinner party) and consult the usual suspects: Elise, Julia, and Young Paul. 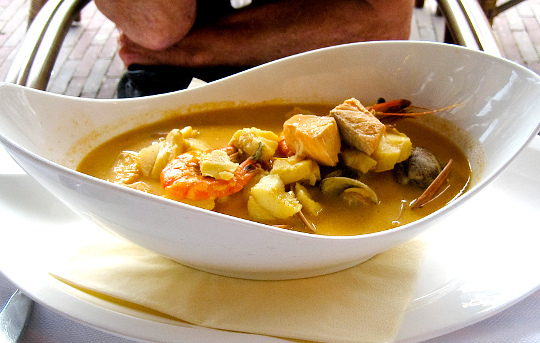 I learned that a true Marseillaise bouillabaisse contains no less than 6 types of fish, and that most seafood purveyors will sell fish heads and bones by the pound for fish-stock purposes. Alas, by the time I arrived at Whole Foods yesterday evening, they had run out, so I made do with the frozen variety that had been handmade by the guy behind the fish counter. 1. Heat the olive oil in a large stock pot over medium-high heat, then add the onions, shallots, and fennel. Cook for a few minutes until veggies soften, then add the garlic. Saute for a minute or so. 2. Add the tomatoes, orange zest, herbs and spices. Saute a couple more minutes. 3. Add the stock and bring to a boil. Simmer for about 20 minutes. The liquid should reduce by about half. 4. Add the fish and reduce heat to medium. Let simmer for 2-3 minutes. 5. Add the clams and cook until they open completely (about 4 minutes). Let the whole thing simmer for a few more minutes. 6. Serve with crusty bread and white wine (we opened a bottle of St. Supery sauvignon blanc). This entry was posted in French, Main Dish, Recipes and tagged Bouillabaisse, SOC. Bookmark the permalink.